In April 2015 my dad and myself set out to find the infamous Northern Lights and discover all that Iceland had to offer. Unfortunately we came up short on both fronts. The weather was too wet and cloudy to see the lights and we discovered that Iceland has a lot more to offer and 4 days just isn’t enough time to see and do everything in this magnificent country. Here is what we got up to on our trip. At the time we took this trip there was no direct flight from Dublin to Iceland, that is unless you took a chartered plane and went with a tour operator, which is what we did. Now WOW Air fly directly to Reykjavik a couple of times a week. Check out their flight schedule here. We arrived into Reykjavik airport and made our way into the city to the hotel (Radisson Blu) straight away. The bus journey takes about 45-60mins. Because we only had 4 days in Iceland we had a pretty good plan of the things we wanted to see and do. As a result we had a quick turnaround before heading to one of Iceland’s most visited sites, the Blue Lagoon. We took a 4.15pm bus with Reykjavik Excursions from our hotel and returned on the last bus @ 9.15pm back to Reykjavik city. The Bus takes roughly 45mins+ to get there but a little longer on the way home as it stop at the numerous hotels. Being one of the main visitor attractions in Iceland it does get very busy so buying admission online before you arrive is advised. However you can always chance it and buy admission on the day like we did. There are several different packages to purchase. We went for the Premium package, which included a free drink, flip flops, a robe, a towel and a locker. Once in the lagoon, make sure you grab a drink from the in-pool bar, check out the natural steam bath and go to the observation deck for great panoramic views of the lagoon and surrounding area. Also try putting the silica mud on your face. It can be found in buckets around the lagoon and it’s great for your skin. That night we had a northern lights boat tour booked, but due to bad weather it was cancelled. The company policy allows you to reschedule for another day or even other activities. **Tip** To maximise your time, head straight from the airport to the Blue Lagoon. There are multiple bus services that go there and it’s only a 15 minute journey versus 45+ minutes from Reykjavik city centre. There is large luggage storage at the Blue Lagoon so bringing your suitcase isn’t an issue. For our second day we had planned to do the Golden Circle Tour, so we rented a car from Red Car Rental (located at the bus depot). We had booked a medium sized car but got upgraded to a large 4×4, which was great for driving in the snowy conditions. Renting the car worked out way cheaper than paying for a company tour. Also, renting your own car means you can stay at the sites for as long as you want instead of being rushed off and missing these great attractions. Trust me when your at the sites you won’t want to leave. We visited all of the usual Golden circle sites such as Gulfoss, the Geysers and Pingvellir National Park along with a few small stops like a natural hot springs and another national park. This tour is a must as it allows you to witness some of the most amazing natural wonders of the world. They look even more spectacular when surrounded in the snow, so try go in the Winter or Spring months. Saturday – City tour on foot. After two days on the go with activities we decided to stay in the city and explore all that Reykjavik had to offer. We started the day with another epic buffet breakfast in the hotel and followed it up with some massages in the hotel spa. After a nice relaxing morning we walked into the city and tried some of Iceland’s famous cuisines, hotdogs and lobster soup. We checked out Hallgrímskirkja (the famous church), the boat sculpture at the viewpoint and the opera house by the harbour. Reykjavik is a pretty small city and everything is within walking distance. There are lots of really nice boutique shops, restaurants and bars around so there is plenty to see and do. That evening we went to Kopar restaurant in the old harbour for dinner. We had the 9 course tasting menu which was exceptional, I highly recommend it. The tasting menu consists of 3 starters, 3 mains and 3 desserts. It includes an amazing Daim Cheesecake, which has my mouth watering as I think of it now. The only tour we had pre-booked prior to arriving in Iceland was the Glacier and South Coast tour with Extreme Iceland. The highlights are seeing some amazing waterfalls, visiting the black-sand beach, climbing the fourth biggest glacier in Iceland and taking in some great Icelandic scenery. This is a minibus tour that operates from Reykjavik and it gives you the opportunity to take in some great sites and scenery with experienced guides and a small group. The first stop on the tour was Seljalandsfoss waterfall. It’s unique because you can walk behind the falling water. After climbing behind Seljalandsfoss we jumped back on the bus and geared up for hiking the glacier. We were given crampons, harnesses, ice axes and helmets and were on our way. Sólheimajökull glacier is part of Myrdalsjökull, Iceland‘s fourth largest glacier that covers the infamous volcano Katla. The hike is fairly easy and is suitable for all ages and fitness levels. Climbing the glacier was definitely the main highlight on this tour for me. But I could be biased, as climbing a glacier was a bucketlist item for me so it was great to be able to tick it off. Reynisfjara, the black sand beach is where we go after the hiking. In Reynisfjara you encounter stunning basalt columns, vast black sands with the majestic sea stacks of Reynisdrangar dominating the horizon. The last stop of the tour is at Skógafoss Waterfall. 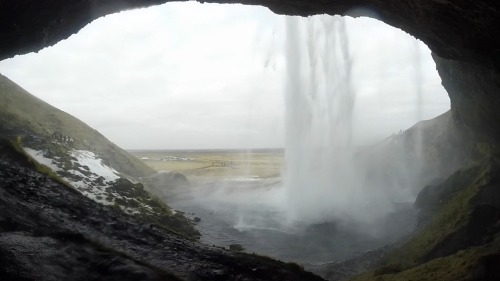 This impressive waterfall is one of the most visited sites in Iceland and for a good reason. There are two great photo opportunities at the waterfall, one at the base of the fall and the other at the top. The view from the top involves a steep climb but the view is pretty amazing so it makes it all worth while. After a long journey back to Reykjavik and a quick freshen up we made our way into the city for dinner. 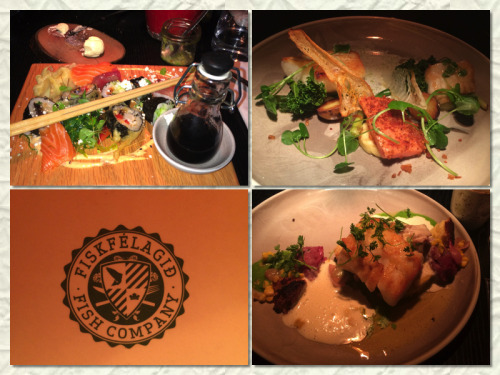 We ended up in a restaurant called Fiskfelagid or Fish company in English. It’s a more upmarket restaurant so it was a little bit pricey but worth every bite. We got a mix of sushi, cod, catch of the day and pork belly. All dishes were amazing. Monday – Massages & chill/optional trip to Blue lagoon and home. On our last day in Iceland we had a couple of hours free before being collected to head to the airport. Because we had done everything we planned to do, we chose to use the hotel spa and relax after a hectic few days. However other things to do on your last day include, visiting the Blue Lagoon, exploring the city or choosing one of the many half day tours on offer. To sum this post up, Iceland has so much to offer, from its breathtaking scenery to adrenaline rushing activities to its amazing food. It was definitely one of the best trips I’ve ever been on. I was completely blown away by this stunning country and can’t wait to go back and explore it again.